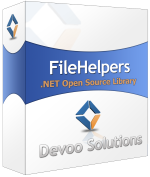 FileHelpers is a free and easy to use .NET library to import or export data from fixed length or delimited records in files, strings or streams. You can strongly type your flat file (fixed or delimited) by simply describing a class that maps to each record and later read or write your file as a strongly typed .NET array. 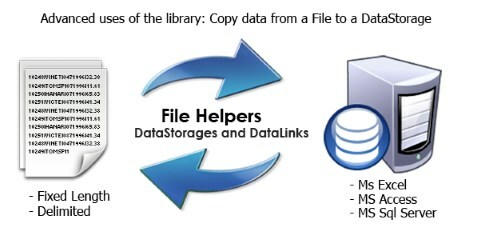 The library also has support to import or export data from different data storage types like Excel, Access, SqlServer, etc. Who needs the File Helpers Library ? In almost every project there is a need to read or write data from/to a file of a specified format. For example, log parsing, data warehouse and OLAP applications, communication between systems, file format transformations (for example transforming from a fixed length to a CSV file). This library aims to provide an easy and reliable way to accomplish this task. The library has a set of converters for common types and can be easily extended to provide custom converters. The engines of the library contain events to make it easier to extend the behavior of the library. Check the INotifyRead and INotifyWrite Examples. The library doesn't use reflection to get or set the field values; it uses dynamic code generation. .NET Framework 4.0, 4.5, .NET Standard 2.0, .NET Core 2.0 and Mono! You can use the library to sort files with millions of records and MBs. To convert files in one format to another (for example a file with CSV to a fixed length record format). Provides the ability to compare files with the same record layout. You can process hierarchical data with this engine. The library supports Nullable types in the core. The library is completely free to use in any kind of development. The library can deduce the record class based on a couple of sample files. We provide a Wizard app to help in the creation of the Record Class. The FileHelpers library is released under MIT License that allows the use of the code and binaries in all places, including commercial applications. 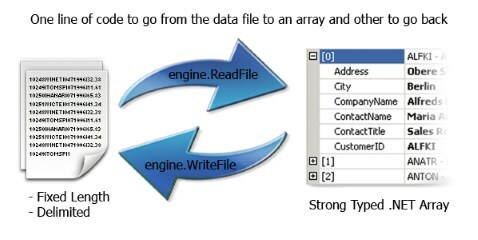 EasyLOB is a Data-Driven Design Archetype for developing Web based .NET Line of Business (LOB) Applications. One of the best references that assists in the development of this library is Framework Design Libraries, a complete guide for design and programming of libraries.